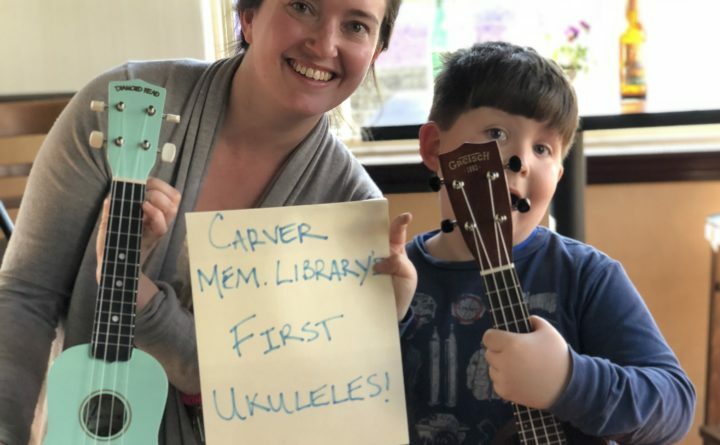 With the surge in player-based music along the mid coast and the state, Carver Memorial Library Director Katie Hessler was telling Steve Tanguay of the Guild about an increased request for instruments to lend through the library. Noting the success of similar programs in other towns like Camden and Bath, the two decided to try and make it a reality in Searsport. Reaching out to the Old Time Players group, Tanguay teamed with Jim Hyland and Bill Smith of Belfast to gather musicians together for an evening of fast & slow jams culminating in an intimate performance. Old time music is a style of playing stemming from the Appalachian mountains that focuses on participation of musicians of all levels. The energy for the evening was buoyed by the generous support of Chef on the Run, Tina Cook of the Purple Food Truck, WERU. WBFY, and the local cable channels. 50 people gathered for 3 hours of fun and raised (over $1000.00 in instruments and funding) $350 + 3 instruments to create a stringed instrument lending program in Searsport. The program currently being developed now has two 2 ukes, 1 guitar, 1 mandolin and 1 fiddle for lending. Everyone agreed that we need more of these community based gatherings and there are plans for future jams being developed.